snow | 0001 Awful Thing(s). Well as we all enjoy a great day of snow, romping and playing around and not having to go back to school…the reality is you’ll have to make it up sometime later in the school year. We found out today that they’re changing the Early School Release Day to a different day (a previously scheduled day off) and now making it a half day and the previous half day now a full day of school. Phew! Technical huh? The high schoolers fairing off a bit more crazier seeing as they have almost a week full of half days and they are making it up almost the next few days at the end of this month. So although it is exciting to see that the weatherman predicts several inches of snow, it isn’t exciting knowing you’ll have to make it up later on and at some time that’s the most inconvenient for you. Oh well, not much we can do there about that since it’s more of a school board decision. A quick walk out in the snow has it’s perks! Just to gander at the white blanket of nature’s bliss! To get the load of mail that the mailmen left! To check the damage of snow on your car that has to be shoveled in the morning! 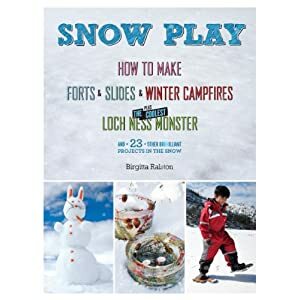 To watch your friends or kids make snow families! As you take a few minutes to take a look at the precious snow wonders – PLAT! Snowball to the back of your shoulder! Grab a snowball, cause the war has begun! Nothing is better than the sweet revenge for little Kaleb who tore up your back porch swing this past summer because he thought it was a rocket that would sail him off to the moon! Here comes a snowball orbiting right to his head now! Score one for the team, score two for the red blistering pain he’ll get crying back home – awfully enticing snowball pitch! After seeing this I should have got a hint! It’s one thing to go get your groceries, but after a major snowstorm you’d figure a basket was enough. Filling it up beyond the basket should have been the sign when I had to turn back outside to get a cart from the store. Happily filling up my basket the bags piled in the cart. Once stepping outside the light slush made it passable until I felt like a mule on the Oregon Trail slushing and sliding and pushing this winky dinky cart to my car. I enjoyed how the onlookers walked by not offering to help but to comment, hmm.. maybe it needs all terrain wheels. Thankfully I found a patch of snow cleared parking lot. Thanks snow-covered ground, thanks full cart, and thanks for the awful commentary! Hope you get a cart full of groceries. Now much onward to my home! the snow begins to fall…. and fall creating a fort of snow that will cause only a pioneer bulldozer of a jeep/truck to dig through the muck. Cars stranded on the side of the road, frozen in fear since the roads are more impassable by the hour. So as you sit there “bored” trying to figure out what to do the hours slowly drain by. What did they do before the internet? Read books….write actual letters to people….play NES….actually call someone and talk to them…the sheer horror! Nothing to do but idly wait until the snow melts and the roads are safe…how awfully cold it is to be blown into a white slumber!